Charlie loves to watch his relatives and friends get thrown high in the air during the traditional Inupiat blanket toss. But secretly, he’s afraid to try it himself. At the Whaling Festival, he’s ready to step up and overcome his fears. 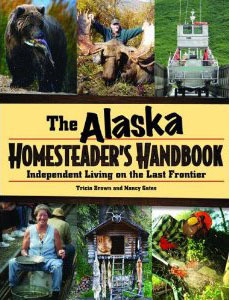 Warm humor and good energy fill the pages in this inspiring story while authentic details of Alaska Native life are shared to anchor the story in place. Glowing illustrations depict Charlie’s family and village friends as they prepare for the big celebration while action scenes capture the excitement and spirit of the Festival. Exhilarating moments are expressed in the text with fun to read aloud phrases that little ones will enjoy. Ages 6-9. A Children’s Book Council’s Seasonal Showcase selection! Silver and Gold: Friends New and Old. Click here for more information. 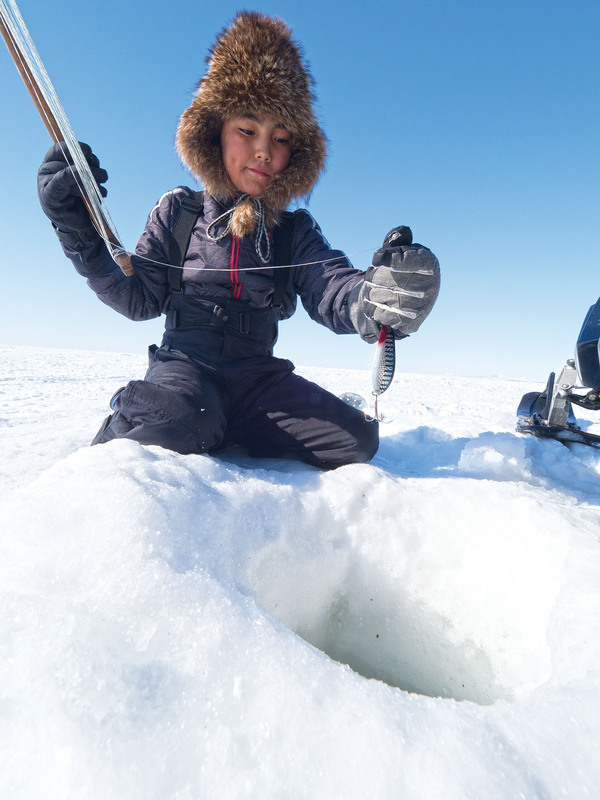 K-Gr 3–Charlie, a young Inupiaq boy, is joining the villagers for one of the most important celebrations of the year. After a whale hunt is successful, the entire community celebrates with a traditional feast, games, dances, and, most important, the blanket toss. 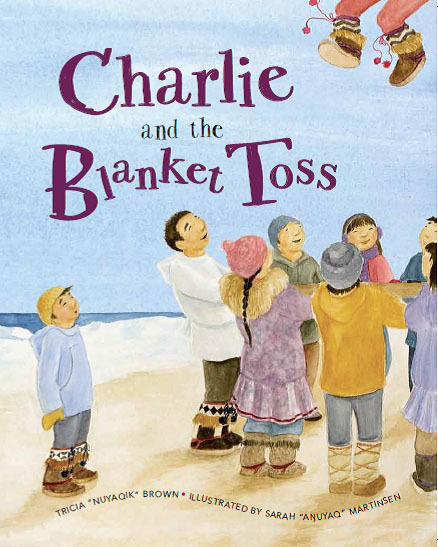 While Charlie is very proud that his father was the captain of the whaling crew, he is nervous about the blanket toss, as it will be his first time being tossed so high above the ground–and in front of his entire town. Young readers will empathize with Charlie’s fears in this sweet story. 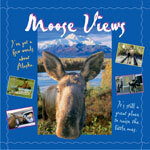 Illustrations show the Alaskan setting in a style that radiates joy and warmth. The text is a bit wordy for young children reading alone, and the pale images may not translate as well to a large group setting, but the content is a perfect way to introduce children to an this Native culture. Inupiaq words are scattered throughout the book (with pronunciations), and a glossary and a helpful note on Inupiat whaling tradition, including conservation efforts, appear at the end. 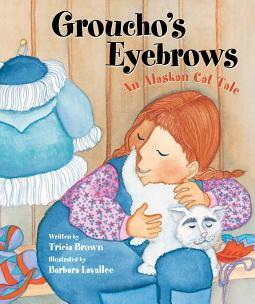 –Elizabeth Nicolai, Anchorage Public Library, AK Copyright 2014 School Library Journal, LLC Used with permission. A young boy overcomes his anxiety about taking a celebratory flip in this brief but immersive look at modern Inupiat village culture. Though Charlie’s feelings about the toss–a traditional activity of the Nalukataq, or Summer Whaling Festival–are mixed, he looks forward to much of the rest of the celebration. He loves the drumming, the dancing, the proud sharing out of the bowhead whale that his father and other whalers have harvested, and particularly the uqsrukuaqtaq (doughnuts), mikigaq (fermented whale meat with blubber and tongue), akutuq (ice cream made with caribou fat) and other delectable foods that have been laid out on tables behind a tall windbreak of plastic sheets. Brown supplies pronunciation guides and definitions either in context or in the appended glossary for the many Inupiaq words in her short narrative. Though very thinly applied colors give the illustrations a diaphanous look, Martinsen provides plenty of culturally specific visual details as well as lots of smiling, round faces. Buoyed by his grandmother’s tale of her own grandfather’s blanket toss as well as memories of his older brother’s, Charlie decides he’s ready. A wordless spread with Charlie flying high over the curve of the Earth, a whale spouting in the background and the community holding the blanket tight says it all. Teachers, click on the link below to download a study guide! Sarah Martinsen is a designer and graphic artist who lives and works in Barrow, Alaska. She enjoys participating in Nalukataq as well as other community events in this special city. 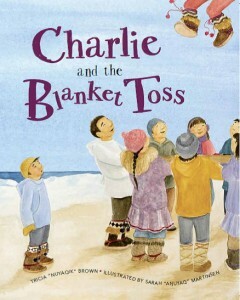 Charlie and the Blanket Toss is her first children’s book, however, she has extensive experience in illustration and design. 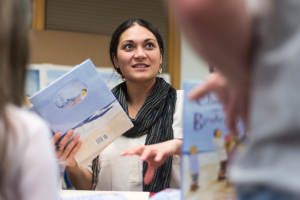 She is an inspiring speaker, especially for children looking to follow a career in art.